Hi there! 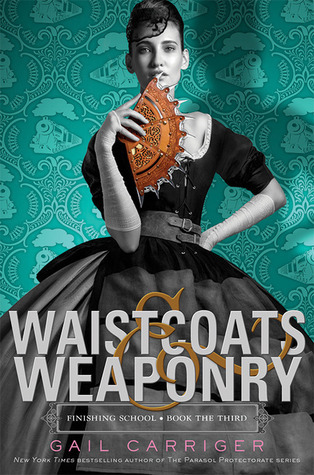 Today I’m sharing a review for Gail Carriger’s third Finishing School novel, WAISTCOATS & WEAPONRY. I just adore this steampunk world! I have read and enjoyed both Etiquette & Espionage and Curtsies & Conspiracies, which tended to be more “tween” in tone. With this third installment the storyline has taken a decidedly YA turn. Yay! This is the third book in the YA steampunk Finishing School series. It is best to read these books in order. World note: the story takes place in a steampunk setting, in 1850’s England, where vampire and werewolves are a part of society. The girls all straightened. Lady Linette’s lessons were always interesting, but seduction was supposed to be the best. What young lady didn’t want to know how to manipulate a man? This was what finishing school was all about! Sophronia has a BF, Dimity who is more interested in a normal life after school, but Sophronia knows she has several options in front of her. She has an unknown (but she suspects royal) patron who pays her schooling. Plus, she receives regular gifts from a rogue vampire Lord Akeldama high in London society. She has a bosom friend in Lady Kingair “Sidheag” whose family is a pack of werewolves in Scotland. It is when Sidheag receives notice that her beloved pack is in disarray and her great-great-grandfather has challenged for Alpha of a London pack, that life goes wonky. Sidheag flees to London to intercept Lord Kingair accompanied by the werewolf arms training teacher, Captain Niall–which will absolutely ruin Sidheag. Meanwhile, Sophronia and Dimity are released from school to attend the engagement ball of Sophronia’s brother. Who also has garnered invitations? Dimity’s brother Pillover, and Felix– Lord Mersey–both of whom attend the companion school, Bunson’s School for Evil Geniuses. Pillover isn’t much of a fan of Felix, and neither is Sophronia’s (inappropriately close) acquaintance Soap. Soap is a black boy who works as a sootie at Mlle Geraldine’s, tending the boilers and boys who also work below decks. It seems that Soap and Felix have a bit of a tendresse for Sophronia, thought Sophronia’s of mixed opinion on them. She knows Soap is an unsuitable mate; he has no family, and even worse prospects. But Felix, despite being son of an Earl, is also allied with the Picklemen–a secret society which despises the supernaturals in society and wishes to control communication across the nation. As a friend to Sidheag, and receiving aid from a vampire, Sophronia is not opposed to the supernatural, and the Picklem tried to kill her and Dimity in previous books, so she’s decidedly against Picklemen. And then he was bending down, looking as if he might actually kiss her–in the back of an open cart! Interruption of the engagement ball by Sidheag and two werewolves is almost a welcome distraction. Especially when all the mechanicals of the house go absolutely bonkers. Sophronia, Dimity, Sidheag, Felix and Soap depart to bring Sidheag to Scotland, so she can help her uncles in the pack who are likely to be slaughtered now that they have no Alpha and are accused of treason. The ladies dress as boys (scandalous!) to ease travel, and stowaway aboard a train. The trip is entirely eventful. “I know a better way.” He pursed his lips at her. Soap isn’t quite as lucky. Though he does live to see another day. This series is a hoot, for real. I love the wit, and the banter. It’s truly fun, and the new advent of more teen-speak is welcome. Sophronia’s world is one of strict social mores, but what does one do when confronted by a naked aristocratic werewolf in all his hairy…dangly, glory? How on earth was Dimity going to react to dangly bits? Will she faint? She’ll probably faint. Spoiler alert: She didn’t faint. Interested? You can find WAISTCOATS & WEAPONRY on Goodreads, Amazon, Barnes & Noble, and your library shelves. You can find her on her website, Goodreads and twitter. Gail has a fun newsletter the Monthly Chirrup, and you can sign up here.